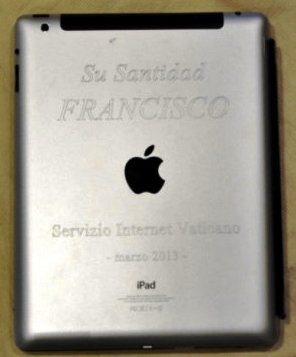 “An Apple iPad which belonged to Pope Francis fetched $30,500 at auction on Tuesday, with proceeds going to a school for the poor in Uruguay, the local auction house selling the item said,” Malena Castaldi reports for Reuters. MacDailyNews Take: Congratulations to Liceo Francisco de Paysandú! Ha! Try reselling a Samsung Galaxy! Seriously, glad to hear of it. Hmmm, I’ma wonder if the Pope-ster is a gonna get an Apple a’Watch? A great way for the Vatican to generate cash. Everything the pope touches multiplies in value. Used items usually decrease in value. I’m honestly glad that money is being used to help the needy and not going into buying some golden goblets or overpriced papal slippers. Like the Vatican needs cash! Net worth between 8 and 15 billion dollars. Along with a lot of bad, the Catholic Church has done some tremendous good with all that cash. Why anyone needs a middle man between them and Jesus I’ll never know, nor why anyone would pray to Peter, Paul, Mary etc when ya know, Jesus is right there, I’ll again never know, but by large, it’s more good then bad and more power to them. Try reading the article. The proceeds go to a school in Uruguay. Black smoke, no new iPope, white smoke, new iPope! I will never understand why people will pay so much money for something that a famous person once owned. I always expect it is so they can lick his DNA off the screen and gain his powers on a mico-canibalism level. Fair play, what with the money going to a good cause and all, but just imagine what they could raise if they sold off a fraction of that Renaissance art they have standing around gathering dust.